We met the friendly folks of Gus and Grey at a Michigan-made food show a few weeks ago in Lansing. We not only thought they were friendly and fun but that their jams were FANTASTIC!! From their Notorious F.I.G. 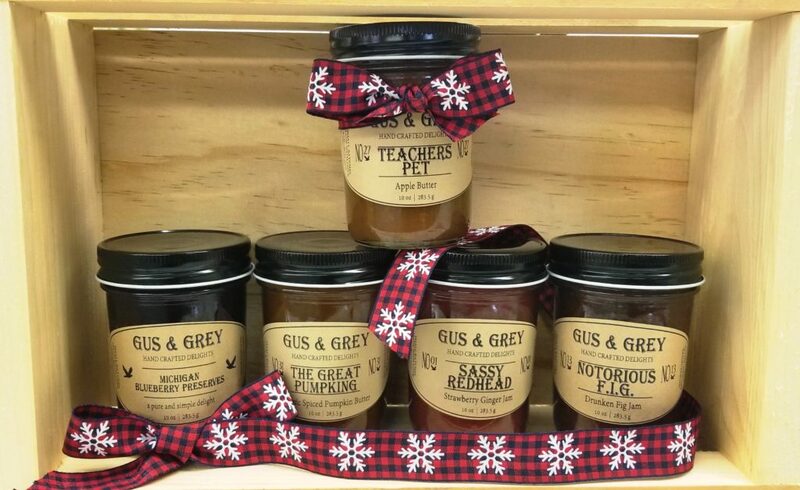 to their Teachers Pet, their jams and butters will knock your socks off! Take a minute to find out more about how this company started! “Growing up in Western Michigan, I was surrounded by farms of all types. The most amazing thing to me was the beauty of various crops. From corn, cherries, peaches, blueberries, beans, asparagus and much more…I loved the idea of growing food, harvesting, preparing and finally have it shared with the people around me. The first time I remember anything being “canned” was my Grandmother, Patricia Tufts, and she spent all day making bread and butter pickles. Her recipe is still my absolute favorite! My first experience with canning with fruit, was really grape juice, and it was in fourth grade, and Mrs. Tutak had the class make (what seemed like) a million jars, to sell at the church Christmas bazaar. It was a simple grape jelly, and at that time, it was the best thing that I have ever tasted. I wonder now if it was because so much time and love went into the project…either way…I loved it. Flash forward about 20 years. I was living in NYC, and though I hadn’t thought about canning in nearly two decades, and couldn’t shake the idea. I called my mom and had her search for my Grandma’s bread and butter recipe, and when I finally received it, I couldn’t get to the market fast enough to buy all the necessary ingredients. After my friends gobbled every last jar up, I decided to try out a few jams. I made about 12 jars of apricot jam, and gave the majority of it away – to the same pickle gobblers – and the feedback was simply outstanding! I have a friend who saved his jar for his mom’s visit to Brooklyn, and I received one the biggest compliments! His mom said that she hadn’t tasted anything like that since she was a kid! Can you imagine the smile on my face!!! I knew that I was on the right path. I kept trying out and creating new recipes, and never thought about starting my own business, until I moved back to the Detroit area, and a new crop of friends were hooked, and obviously, so was I. This endeavor has been a labour of love, and I want to thank every single person who takes the time to read what I have to say, and enjoy all that I prepare. We invite you to come in and take a taste of what makes this product great! Don’t forget that we have plenty of other fun and exciting Michigan-made products from cities across the state! Until January, we are open every day and always ready to help you find the perfect Michigan themed gift for here or to send out! We are always ready to ship!